The jar of Trentino honey joins other honey on my shelf each with its own sweetness of memories and place. 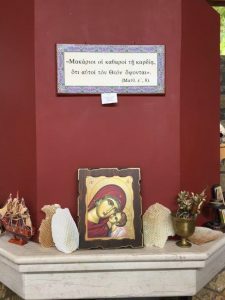 One jar is from the mountains in Piedmont, in Northern Italy, near the Black Madonna Sanctuary of Oropa. Another small jar is from Campania in southern Italy, a gift from a friend who visited the Sybil’s cave in Cuma. 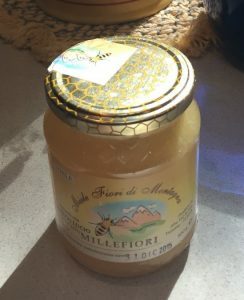 From Crete, there is a large jar of mountain honey, the quintessential nectar of place. Of course, there is a quart jar of local reddish-gold honey, from a nearby island store where it is available on tap, and which runs faster on these warm summer days. In the Mediterranean on the island of Crete, bees and bee priestesses appear on fine jewelry of antiquity. A gold signet ring, more than 3000 years old, found near Knossos portrays a Bee Goddess and women in sacred ritual to her; each has the head of a bee. An exquisite Minoan gold pendant from Malia is intricately shaped in the form of two bees carrying a golden drop of honey. While on a pilgrimage in Crete with Carol Christ in 2015, some of us in the group heard the sound of wild bees near an immense tree on the Omalos Plateau. The din added to my already heightened senses as we walked through the rocky, mountain forest to the site of an ancient outdoor shrine. Later, during our lunch at the Aphrodite Tavern in the town of Kato Symi below, we were able to taste the honey that the local farmers had gathered. 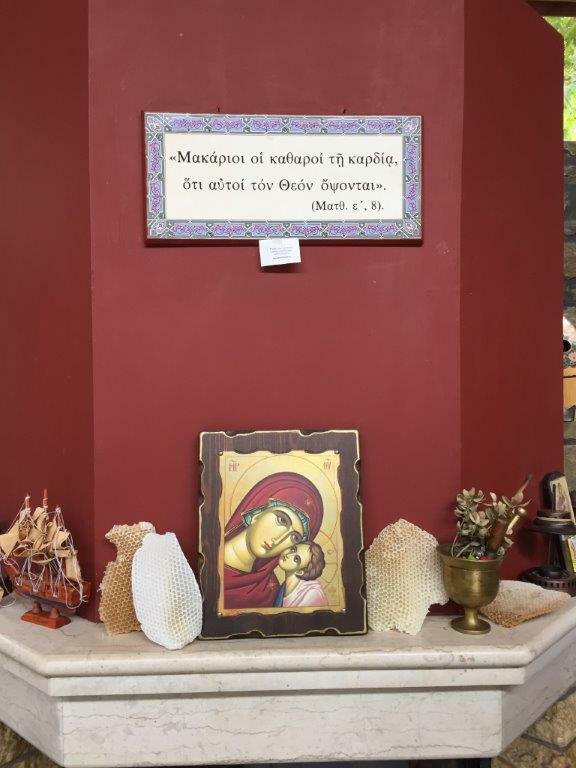 Pieces of honeycomb, like temple offerings, rested on either side of a small image of the Madonna displayed on the hexagonal mantle, a little altar of tribute and blessing. This entry was posted in Food, Plants, Trentino and tagged honey, sacred by Mary Beth Moser. Bookmark the permalink. Lovely Ms. Moser…rich imagery and left me longing for all those honeys! Thank you for that lovely history lesson. I hope we can get some on our trip in October.